How does Scotchgard™ Protection work? Scotchgard branded products are innovative carpet protection treatments developed by 3M. Applied by the carpet mill, they provide an effective protective treatment by surrounding each individual carpet fiber with an invisible shield. Scotchgard protection improves the fibers' resistance to water-based stains, as well as soiling from everyday use. How long does the Scotchgard protection last? Under "normal" conditions and with reasonable care, Scotchgard protection will provide long lasting benefits. However, performance will diminish somewhat over time with each hot water extraction cleaning. For optimal soil and stain protection, 3M recommends that Scotchgard protector be reapplied after every hot water extraction. 3M recommends using a reputable professional cleaner. The operators will provide up to three referrals for a given postal zip code or city within the U.S. or Canada. For more information and an online referral service, explore the IICRC web site at www.iicrc.org. Why doesn't water "bead up" on carpet featuring Scotchgard protection? Some carpet fibers may not exhibit the beading characteristic typically linked to Scotchgard protection. This can be caused by spaces between loosely woven carpet pile. This does not affect the stain and soil resistance of the Scotchgard brand application. Most common household liquids can be easily blotted up even if the spill does not bead up. Does Scotchgard protection "waterproof" carpet? Scotchgard protection is not intended to be used as a waterproofing agent for carpet. However, it will provide improved resistance to water-based substances. Is Scotchgard protection safe for children and pets? Yes, all Scotchgard carpet protection products go through extensive testing and have been safely used in homes for more than 20 years. How should carpet featuring Scotchgard protection be cleaned? Soil is the greatest threat to your carpet's appearance. You can't vacuum too often. Use a vacuum with a beater-bar that will raise the pile while it removes soil. Blot up spills immediately. Immediate attention to spills and spots will make removal easier. Always blot the area being cleaned. Never rub, scrub or brush. The Scotchgard™ Protection and Stain Release Warranty requires that your carpet be cleaned by professional hot water extraction at least every two years to maintain the warranty. Contact the Scotchgard Service Center for professional cleaners in your area. What if I still have a stain problem? For specific stain-related problems, the Scotchgard Service Center offers phone assistance to consumers owning carpet and furniture featuring Scotchgard protection. The service center staff may be reached at 1-800-433-3296 from 8 a.m. - 6 p.m. Central Time, Monday through Friday. Are competitors' products the same as Scotchgard branded products from 3M? No. 3M is known around the world for its technology and innovation in product development. For more than 25 years 3M has marketed and sold state-of-the-art fabric protection for textile goods such as carpets and rugs, upholstered furniture, linens and clothing under the Scotchgard™ Protection brand name. 3M has developed dozens of different Scotchgard protection products formulated to work with specific natural and synthetic carpet fiber types, ensuring optimum performance on any given carpet. When a consumer purchases a carpet treated with Scotchgard protection, they expect the best, that's why 3M works closely with mills to ensure that carpets are treated in accordance with the high quality standards of the Scotchgard brand and 3M. 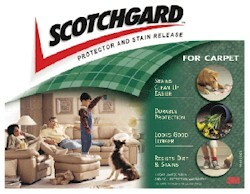 How do I know that I am buying a carpet featuring genuine Scotchgard protection? Always look for the Scotchgard protection label. This is your assurance of the finest quality protective treatment.